With her mother Sayretta, father Amos and sister Sharona looking on, Sharonda Pickering helped the Florida Gulf Coast University Eagles Women’s Volleyball team to its first Atlantic Sun Conference title since 2012, in her last home game Saturday, on Sr. night. The Eagles advanced to Friday’s Conference Tournament in Kennesaw, Georgia, as the top seed and is eyeing its first trip to the NCAA Tournament. Pickering led her team with 12 kills while hitting .647 and had five blocks, during a four set 20-25, 25-21, 25-18 and 25-16 victory over the Liberty University Owls, as they wrapped up the conference title with a 15-1 conference record and 24-6 overall this season. The victory was the team’s 13thstraight win, surpassing the 2008 team for the fourth longest streak in school history, after becoming a Division I School in 1985. They have lost just three sets over the last 10 matches, which include victories in 30 of the last 33 sets. Pickering and her team spent the summer touring Europe and playing different teams as a way of bonding and preparing for the season. They lost their senior Libero/defensive specialist, but had a freshman coming in and dominating the position. 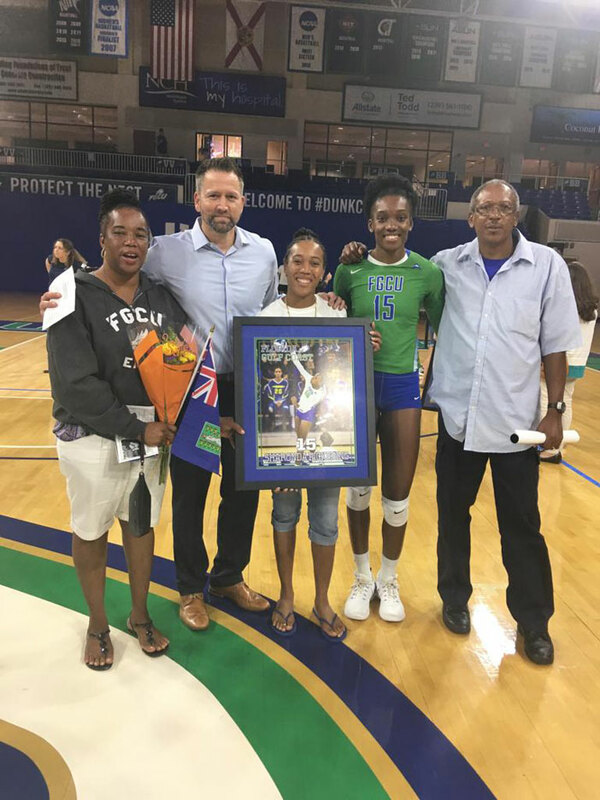 Pickering from Sea Cows Bay who attended Jr. College at Hillsborough Community College and earned a NCAA Jr. College Championships bronze medal in her freshman year, said her senior season has definitely been her best season in college. Pickering said having her family in the stands on senior night was a very special treat. As the top seed by virtue of winning the conference title, the Eagles have a bye to the Conference Tournament semifinals and will face the Liberty vs Stetson winner. Pickering said this year, they have seen the growth of a lot of teams since last year, which will make the tournament very challenging. With a victory, the Eagles would earn their first NCAA Tournament berth.